A lie is often not a lie; it is just a wish for a better state of affairs; a hope. When a person misleads you about his age, for instance, it could well be that he wished he were younger. India is bracing for general elections in April. This is a time for hope and change; lies would be told. 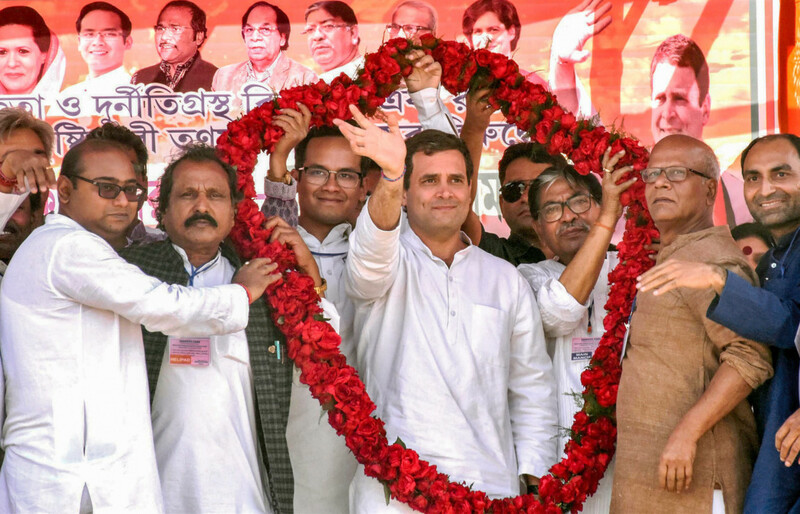 The two chief warring personalities, Rahul Gandhi of the Opposition, the Congress Party, and the ruling Bharatiya Janata Party’s pin-up boy and the current prime minister, Narendra Modi, are at each others’ throats. In the last few months Gandhi has, on innumerable occasions, called Modi a liar; that most of his ‘factual’ claims are fiction. Unlike the early part of Modi’s reign since 2014, when his charisma could override allegations of hollow claims to performance and when Gandhi himself was seen as rather weak and ineffectual as a leader in comparison, these are days when the prime minister is on the defensive. When you have been in power for a period, you could be called out. As is being done now. And the Opposition is free to portray themselves as the next-in-line paradise makers. Gandhi has given in to that temptation all too easily. At a per capita income of $2,134 (Dh7,837; 2018 estimate), India’s GDP rank is a low 119. This roughly translates to a little over Rs10,000 (Dh532) a month. A family of four will not eat well on that amount, let alone stay sheltered comfortably or school its children. In India, according to an Oxfam survey (2018), the richest 1 per cent own 73 per cent of wealth generated. So the actual income of the poor is likely to be less than what a per capita average is likely to show. The poor — or even the lower middle class for that matter — could therefore do with any supplement to their income. But just how Gandhi is going to do this is a mystery. Universal Basic Income is likely to be a lie. Or a wish. Or take Gandhi’s promise last week of 33 per cent reservation of seats in Lok Sabha (Lower House of Parliament). The idea has been in the air for a while now. But, unlike other leaders, Gandhi seems to believe it is easily achievable. That this promise was made at a women’s college in Chennai perhaps extenuates the fantasy. Politicians would like to be seen as harbingers of happy news. And these are days of female empowerment in India. Yet, how practical is 33 per cent of reservation for women? Over the years there has been an improvement in the number of women candidates winning Parliamentary elections. From a low of only 19 women representatives in the 1977 elections, the 2014 elections saw 61 women in Lok Sabha. The Lower House has a strength of 543 seats. What’s the advantage of quota? That adds up to a little over 11 per cent. But it is unclear if this number translates to a gender empowerment lobby independent of party ideologies. The chances are a Parliament bill is put to vote along party lines. If so, what is the advantage of a 33 per cent (indeed, while we are at it, why not 50 per cent?) reservation quota? Equally, why not have reservation for transgenders — if gender must play a positive affirmation role in Parliament? Most glaringly, Gandhi does not say how this number would be practically met as the rough and tumble process of election politics is predominantly a male province. Indeed, it has been a problem getting well-educated, non-corrupt, competent males to stand for election. A few days ago, at a rally in Mumbai, in his effort to topple Modi’s applecart, Gandhi recklessly promised his government would hand out 50-square-metre houses to slum-dwellers; all within the first 10 days of power. At present, slum rehabilitation houses measure 25 square metres. How this increment in space is likely to be done — or from where the funds would come in — is, again, not clear. Elsewhere, in the South, in the course of a speech in Kerala, Gandhi promised the large and beleaguered fishermen community a devoted ministry at the Centre. Gandhi is clearly promising everything to everybody. These promises are likely to turn out to be false in the face of India’s monetary reality. In the event of Gandhi becoming the next prime minister, he runs the risk of being called the names that he uses to identify Modi’s traits. The wise heads in the Congress party must restrain him. Few things have more destructive backlash than promises unredeemed.